My profession was being a professional oboe player, but I have found my vocation in making the oboe playing for you as easy as possible. and Jon Steward at the company Howarth of London Ltd.
2001 Additional training courses at the companies Marigaux and Rigoutat in Paris. 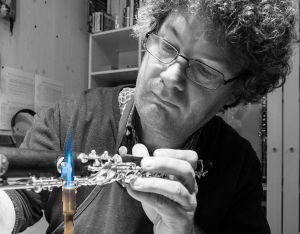 In 2001 I set up my own workshop, the Oboenatelier Christian Voss in Zurich. 2012 I moved and integrated the Oboenatelier to Musik Spiri in Winterthur nearby Zurich. Since then, we consider ourselves happy about the successful cooperation in developing further repair techniques and also expanding the trading of instruments, oboe reeds and other accessories. Whether you are a professional player or an amateur, with my technical skills, precision, reliability, and my joy in collaborating with musicians, I wish to offer you a perfect service. 1978 I had my first oboe lesson. 1989 Change to the Musikhochschule Würzburg, where I graduated in 1992 with an orchestra diploma. 1992 to 1995 Period of postgraduate studies in Rotterdam. 1996 to 1998 Position as oboe and cor anglais player in the orchestra of the Eisenacher Landestheater. Since 2004 the most important events of my musical life are now playing the 1. oboe in „Sinfonietta Schaffhausen“ under the direction of Paul K. Haug and the musical friendships with the organ player Ursula Hauser, the Chamber Orchestra Flawil, Felix Schudel’s Chamber Orchestra Wädenswil and the Bachkollegium Rheintal, under the direction of René Häfelfinger. Last but not least the playing within my family.